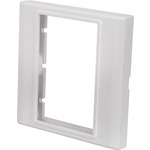 A single gang wall plate frame that can be loaded with any combination of 2 wall plate modules. 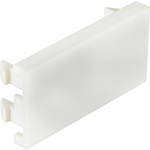 Simply snap the modules in place for a quick and neat termination of A/V or networking connections. Suitable for domestic, commercial or educational applications. Snap on AV module for a quick and neat termination of AV connections. 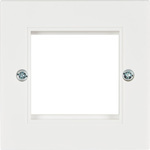 Suitable for domestic, commercial or educational applications, compatible with wallplate frames 122.440 and 122.441. 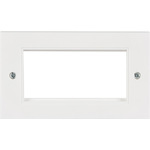 A double gang wall plate frame that can be loaded with any combination of 4 wall plate modules. 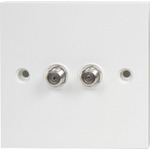 Simply snap the modules in place for a quick and neat termination of AV or networking connections. Suitable for domestic, commercial or educational applications. 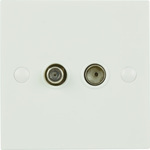 50mm x 25mm clip in module with F-Type screw coupler allowing you to connect a standard male cable to the other side easily. 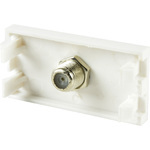 The F-Type screw connector is typically found on satellite and cable TV connection cables. Suitable for domestic, commercial or educational applications. 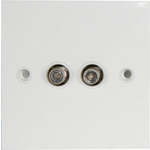 A single wall plate frame that can be loaded with any combination of 3 wall plate modules. Simply snap the modules in place for a quick and neat termination of AV connections. 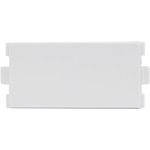 Suitable for domestic, commercial or educational applications. Choice of 18 different wallplate modules.